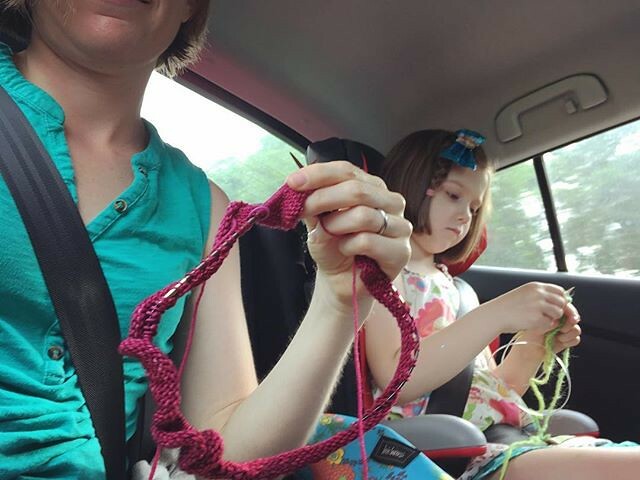 It turned out to be a very good thing that I brought an extra skein of yarn with me on our epic trip to Wisconsin to visit family, because by partway through the trip, I’d already finished one Willow Cowl, and still had 2 days of being a passenger in my parents’ car ahead of me…what would I ever do without knitting to keep my hands busy in the car? 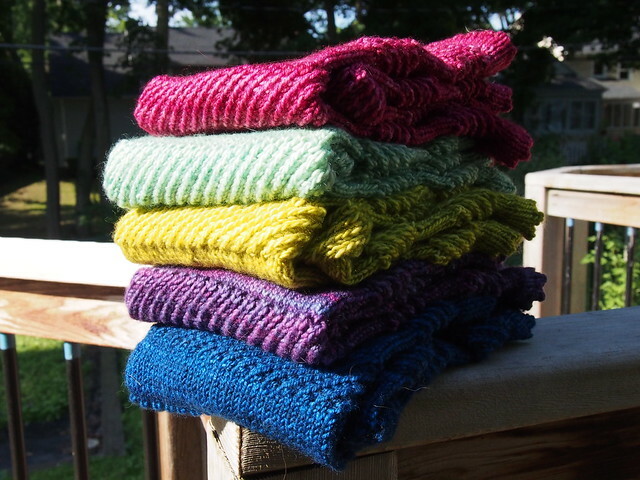 So now, my total Willow Cowl count is FIVE! I also acquired over 50 mosquito bites that afternoon – I have a delayed (usually by about 18 hours) but fairly extreme reaction to them, so while I knew I’d been bit a few times, the full extent only became clear over the course of the following morning. It was decidedly NOT fun! But that’s Wisconsin in the summer for you – so many bugs! I cast on for the next cowl, using Madelinetosh Twist Light in “Coquette Deux”, that evening, and M and I even got to do a bit of knitting in the car together when we drove down to my old hometown of Winona, MN, and stopped in at Yarnology, where I got to see one of my dearest high school friends (love you, Ingrid!) for the first time since my wedding in 2005! 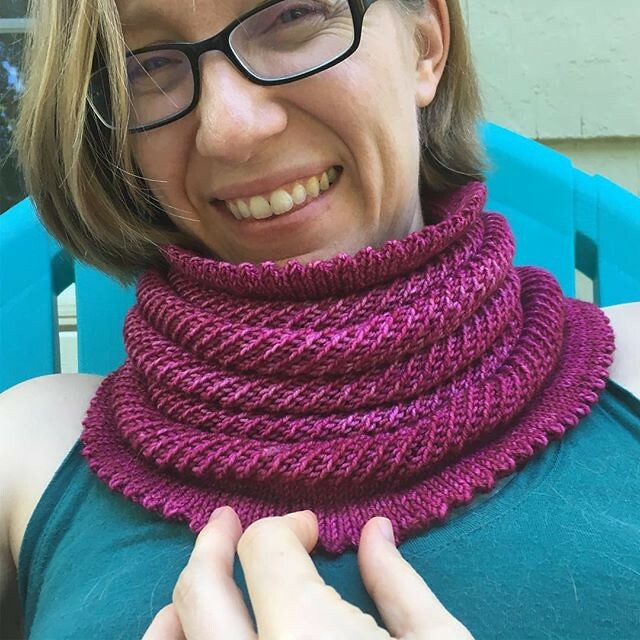 I knit most of the rest of the cowl on the 2 day drive back home, and finished it while hanging out on our deck in the evening with my parents (who were seeing our new house for the first time!). This is how I store them when I’m not wearing them. Don’t they look so lovely all stacked up? 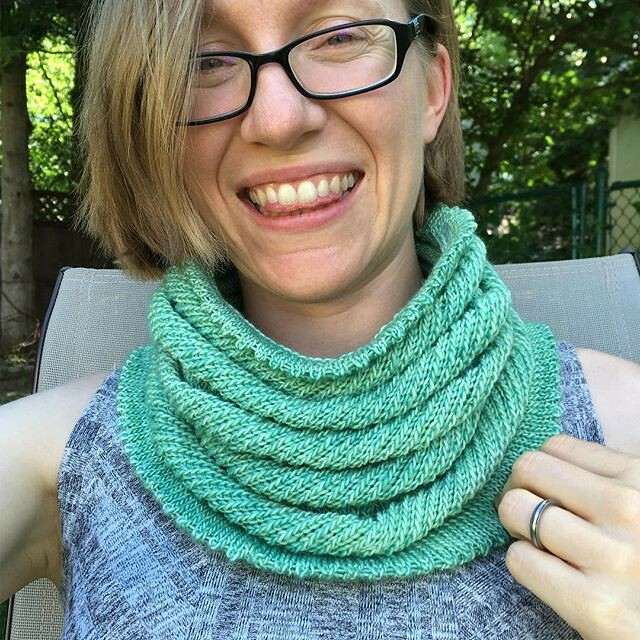 Will I knit more Willows? Perhaps! 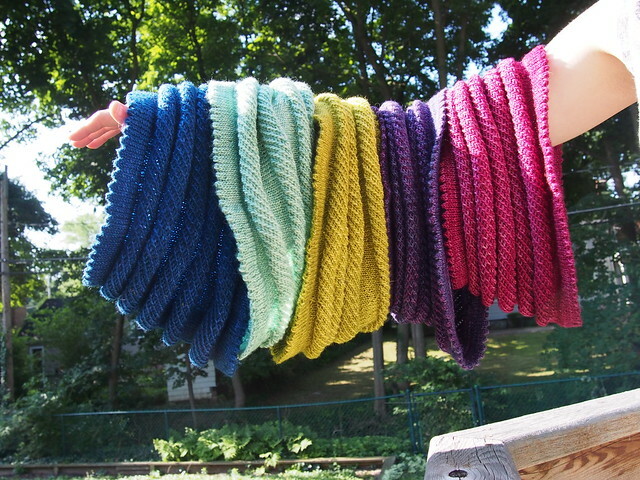 Though it might seem crazy to have so many, they’re such a useful part of my wardrobe for 6 months of the year, and they’re such a great project for mostly-mindless travel knitting! I could see getting good use out of one in a warm brown color, or perhaps a deep pine green…we’ll see! Bring on more Willows! But I think I’ve reached the limit on how many I can wear at the same time! Just squish ’em a little. You can get at least one more on there. 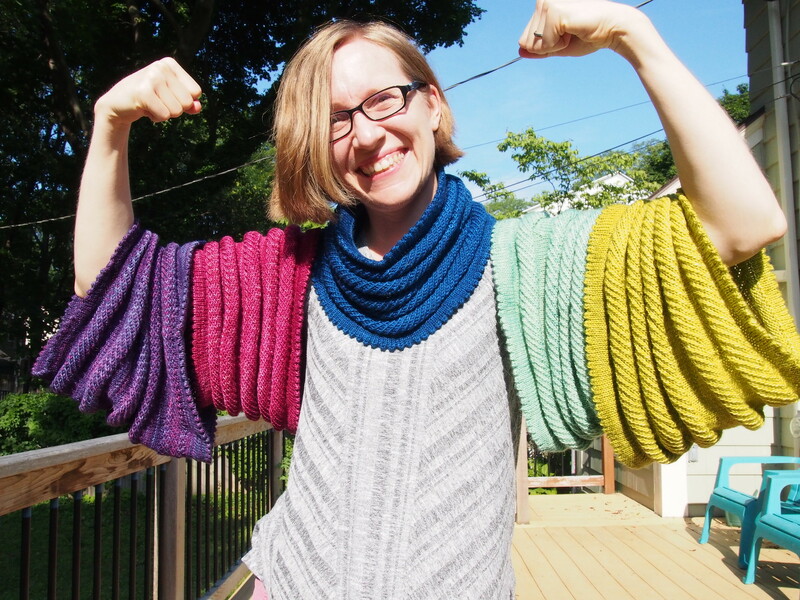 As someone who absolutely buys myself multiple identical shirts in various colours, I am totally on board with the idea of knitting yourself a zillion of these. There’s absolutely nothing wrong with having lots of something you wear every single day. 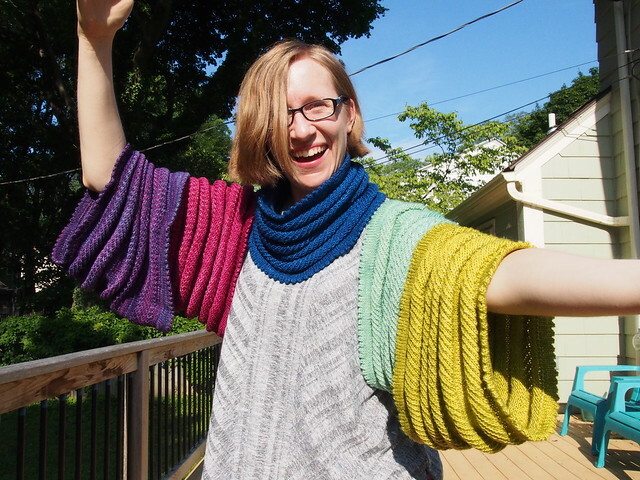 I’m totally a “it fits, so I’ll buy one in every color”person when it comes to shirts and dresses and such, too! Okay, you’ve convinced me! 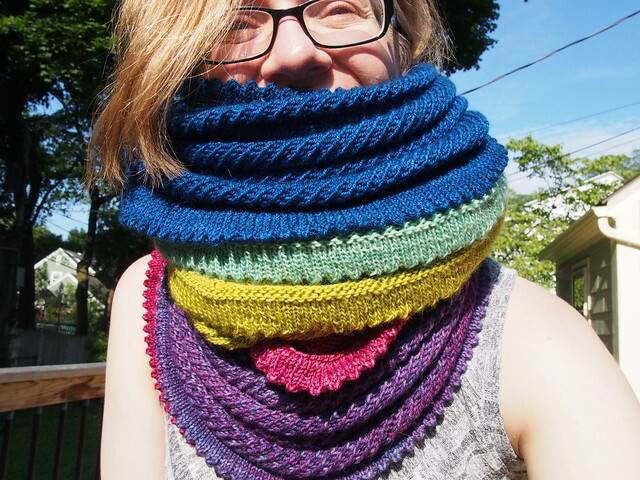 I’m definitely knitting at least one for myself soon. You need at least two more, one each for the other two days of the week.